100% polyester (Navy is 100% cotton twill). 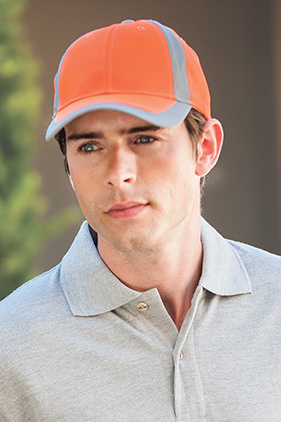 Six-panel, structured mid-profile, high-visibility color crown with reflective grey inserts on side panels and trim on visor. Reflective fabric on Velcro back strap. Matching grey under visor and sweatband. Velcro closure. Hi-Vis colors meet ANSI Class 2 standards. Navy color meets enhanced visibility standards.